At least some people know what really matters. Amidst all the controversy over LGBT rights and abuse, the role of sponsors, arrests of activists, the evictions and suffering of local people, mistreatment of migrant workers building the venues, massive environmental damage, corruption, athlete activism and the 150th anniversary of the Circassian genocide British athletes at Sochi2014 got down to some serious criticism - of how far they had to walk. Submitted by Julian Cheyne on Tue, 11/02/2014 - 14:26. Norwegian snowboarding medal hope Torstein Horgmo has been ruled out of Sochi2014 after breaking his collar bone in an accident on the slopestyle course. 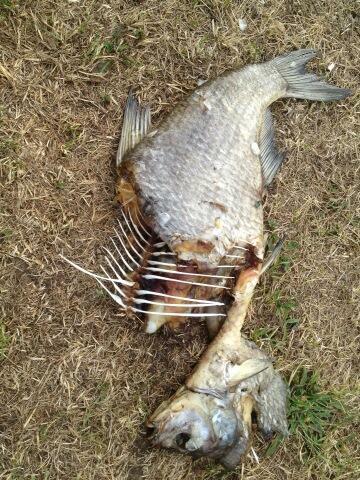 This has been enough to cause the authorities to make alterations to the course. Pity no-one paid similar attention to the accidents which happened at Vancouver2010 prior to the death of Georgian luger Nodar Kumaritashvili in a similarly preventable accident. Instead they blamed it on the luger. Submitted by Julian Cheyne on Tue, 04/02/2014 - 18:07. Submitted by Julian Cheyne on Mon, 03/02/2014 - 01:12. London2012 Pub Legacy - tourists inspired to drink a pint! Eighteen months on and the UK Press is still churning out Olympic miracle stories. Particularly prone to this are the nation's supposedly hard-headed business correspondents. One such is the Telegraph's Leisure & Transport Correspondent, Nathalie Thomas, who is convinced that tourists, particularly Americans, were so inspired by the London Olympics that they can't wait to pop into a London pub to sup a pint of Fuller's beer. As usual no actual evidence is produced to support this 'halo' effect and in fact the piece concentrates almost entirely on home consumers and that other well known consumer miracle, the Christmas effect. But then, this may of course have nothing to do with Ms Thomas but rather that other journalistic phenomenon, a sub-editor pursuing a longstanding editorial policy of boosting the Olympics. Submitted by Julian Cheyne on Fri, 31/01/2014 - 20:25. 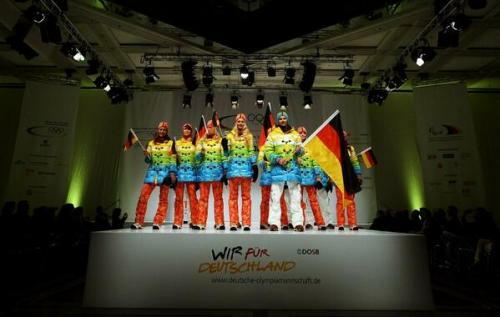 Heaven only knows why the blokes have white pants, but perhaps Putin and his fellow homophobes could be put out by the Germany team costumes? Submitted by Steve Dowding on Wed, 29/01/2014 - 10:34. Submitted by Steve Dowding on Sat, 18/01/2014 - 12:26. Thanks to Julian on the newsgroup for this bit of cheer entitled 'Olympic-style agency to lead transformation of Old Oak Common around HS2 hub'. The Mayoral Development Corporation will lead proposals to build 19,000 homes in a `mini-Manhattan' of skyscrapers and create 90,000 jobs in semi-derelict land north of Wormwood Scrubs. 90,000 jobs! Bojo's outdone even Gordon Brown. Caveat emptor, etc. Submitted by Steve Dowding on Sun, 01/12/2013 - 10:14. Submitted by Steve Dowding on Mon, 11/11/2013 - 23:43. About 400metres to the south of Eton Manor, this Old Etonian got his well-deserved reception a year ago this week. Submitted by Steve Dowding on Thu, 05/09/2013 - 13:47. To enable people to get onto the Park as quickly as possible, the Legacy Corporation has carefully planned its works to re-open the Park in phases, as each piece of work reaches completion. 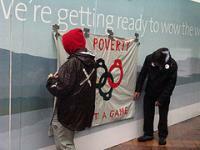 The first area will re-open from 27 July 2013 – exactly one year after the Olympics Opening Ceremony. First to open will be the North Park in July 2013, which in addition to the community hub includes acres of vibrant green parklands and footpaths, perfect for picnics, walks and play. Also here, the Multi-Use Arena, a 7,500 capacity indoor entertainment venue will host a range of community events, along with a yearly programme of high profile sports and concerts. The Legacy Corporation will celebrate the opening of the North Park with an event for local residents and visitors. 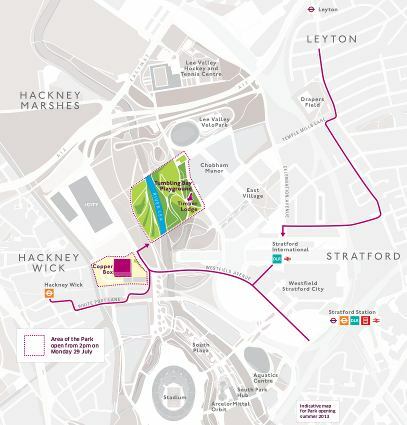 Visitors will be able to access the Park through entrances in Hackney, Tower Hamlets and Waltham Forest, in addition to pedestrian access through Eton Manor. 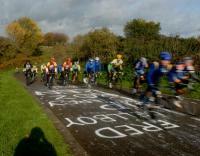 The remainder of the North Park will open at the end of 2013, and will include the Lee Valley VeloPark and more access points for visitors. But as it turns out from 2pm today the news is that its only the southern part of the North Park and there's only the one way in and out. Also, as highlighted elsewhere the bombast of old Etonians Bompas and Parr's opening ceremony finale turned out to be controversial as well as a bit pants (see comments). > Images taken throughout the day, including of the finale, will be uploaded to Dropbox on an on-going basis – download here. > Tens of thousands of people today descended on the Queen Elizabeth Olympic Park for the first day of Open East Festival, a weekend of music, food, theatre and entertainment to celebrate the anniversary of London 2012 and public opening of the park. Musicians from as far afield as Columbia, The Congo, Jamaica and Mali joined local performers including Hackney Colliery Band, whilst top BMX stunt riders demonstrated their impressive skills against the iconic backdrop of the velodrome, and Sacrilege, a life-size bouncy-castle replica of Stonehenge by four-time Turner Prize winner Jeremy Deller entertained children and adults alike. > On both Saturday and Sunday the Open East Festival will culminate in Chromatopsia: A Water Symphony, a mesmerising and surprise commission by artists Bompas & Parr, turning the River Lea emerald green to the delight of the crowds gathered around its banks. At 9.30pm festival goers will be surprised by the sounds of a hypnotic soundscape of water music from a Glass Harp, drawing together contributions by the public recorded throughout the day, which will provide the perfect accompaniment to the glowing emerald green river running through the Queen Elizabeth Olympic Park. It will be created using a combination of safe fluorescein light reactive dye administered by boats and blue lighting. Chromatopsia explores themes of light, sound, colour, liquid and movement and celebrates the river’s place at the heart of London’s newest park. > Chromatopsia was developed in collaboration with the Barbican, Create London, the London Legacy Development Corporation, the Environment Agency and the Canal & River Trust. Bompas & Parr worked closely with Professor John Girkin, Director of Biophysical Sciences Institute at Durham University, in developing the technique and light response of the dye. > Bompas & Parr, named by The Independent as 'one of the 15 people who will define the future of arts in Britain', are famed for their innovative commissions, which have seen them install a tutti-frutti boating lake at Kew Garden, put a crazy golf course on the roof of Selfridges, London and create a walk-in cloud of breathable gin and tonic cocktail. > The Open East Festival includes a host of international music acts on the main music and Caught by the River stages, including The Waterboys, Seun Kuti with special guests Robert Glasper & Dead Prez, a supergroup of Malian artists including celebrated duo Amadou and Mariam, Vieux Farka Touré and Fatoumata Diawara assembled by Cheick Tidian Seck, Ondatropica featuring Quantic and Frente Cumbiero, U-Roy, Bomba Estéreo, Jupiter & Okwess International, Soul Caribbean, DJ Don Letts, Wire, Stealing Sheep, Viv Albertine, Le Volume Courbe and The Rockingbirds. > The Fairey Band, also known as Acid Brass, are also performing at the festival. Acid Brass, the brainchild of Jeremy Deller, is the unlikely fusion of Acid House anthems with the sound of a traditional British Brass Band. Their performances of music by groups like the KLF, 808 State and many more have been huge hits with audiences at music festivals across Europe and beyond. > Open East Festival is a fantastic day out in Queen Elizabeth Olympic Park for all the family. Young visitors will be enchanted by The House of Fairy Tales who will present their legendary Travelling Art Circus (which includes Gavin Turk’s Space Pyramid), encounter Joey from the acclaimed National Theatre production War Horse, and be mesmerised by Graeae’s production of Ted Hughes’ The Iron Man. > There are also opportunities to witness performances from some leading east London artists and organisations, unearth a future masterpiece at the Art Car Boot Fair (featuring Bob & Roberta Smith, Gavin Turk and leading East London street artist Pure Evil), experience the Pandemonium Drummers and BMX riders from the London 2012 Olympic Opening Ceremony and explore London’s newest park. > Sacrilege, the life-sized inflatable bouncy castle replica of Stonehenge by Turner Prize-winning artist Jeremy Deller, originally commissioned by Glasgow International Festival of Visual Art and the Mayor of London, has also finally made its way into Queen Elizabeth Olympic Park as part of the festival. > The Open East Festival continues tomorrow (Sunday 28 July) and thanks to the support of Arts Council England and the Legacy Trust UK day tickets are priced at just £9.50 for adults, £6.00 for children aged 5 - 16, and under 5’s go free. Tickets are available from www.ticketmaster.co.uk/openeastfestival or can be bought at the Box Office at the entrance to the Festival site at the Queen Elizabeth Olympic Park. > Download pictures from the Open East Festival in Queen Elizabeth Olympic Park here. 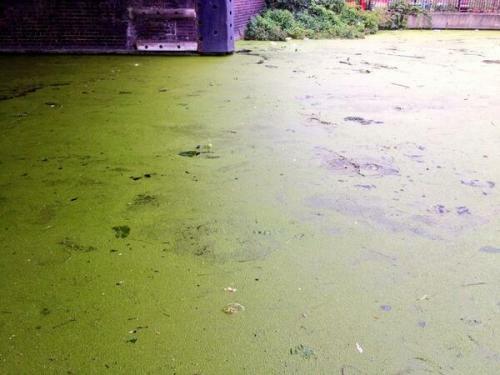 Following last week’s incident upstream of Queen Elizabeth Olympic Park in which fish were affected by reduced oxygen levels in the River Lea, we consulted closely with all the relevant agencies including the Environment Agency and Canal & Rivers Trust on whether or not to proceed with the Bompas & Parr commission. On the advice received we felt that it was appropriate and safe to proceed with the finale for the Open East festival. How "hundreds of big bream dead, bloated and stinking" ended up at Three Mills downstream of the Park is something they chose not to go into of course. Howard Davidson, Director South East, Environment Agency and Tony Hales, Chair of Canal & River Trust, despite their uncanny ability to predict the future in contributions to that press release for "a piece that highlights the natural beauty of one of its key focal points – the River Lea, with the green echoing the ecological credentials of the park", are also possibly aware of the present conditions. Flowing sluggishly alongside Lizzies Lympics Park the Lea Navigation remains suitably green. Submitted by Steve Dowding on Mon, 29/07/2013 - 13:40. 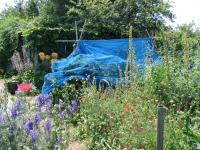 Weymouth Olympics broadband delayed by Olympics! 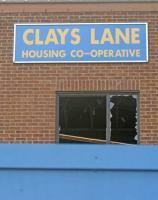 Another fine Olympic Legacy - Justice for Bolt!